Hello again reader, it’s me. One thing that I love about having a crazy topsy turvy life is that everything that happens is grist for the mill! I’ve lived on a sheep station, I’ve travelled and lived out west. I’ve been through bush fires, and floods. Each and every experience has given me an insight into how my characters might handle various situations. After all, historical fiction or not, people are people and mostly people react emotionally to situations. Recently we’ve had an unusual weather system hit and much of the area was crippled due to category 2 cyclone conditions, flash flooding and heavy rain. It hit close to home when my sister’s property was flooded. 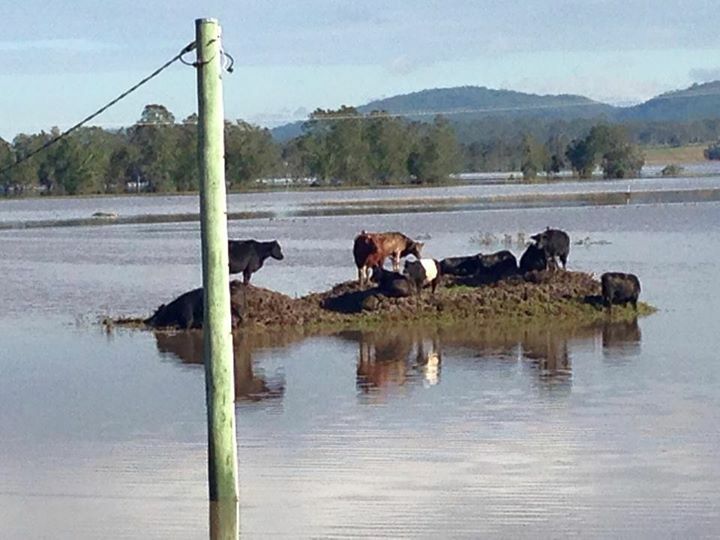 I have no idea how many horses, cattle, dogs, cats and other pets were lost in the flood waters. There were several deaths and many dangerous situations. These floods aren’t unusual in themselves, its just that the folk who live in town are less effected by the weather. This storm that lasted days, has impacted tens of thousands of homes and properties. Many of the effected were town dwellers, where water and power supplies were disrupted for days. Phone service was limited and staying in contact was difficult. This really hits home when you can’t contact people who may or may not be in danger. In my current WIP (work in progress) I have my MC (main character) battling the elements as she takes on the responsibility of running her father’s property on the newly colonised Hunter River. 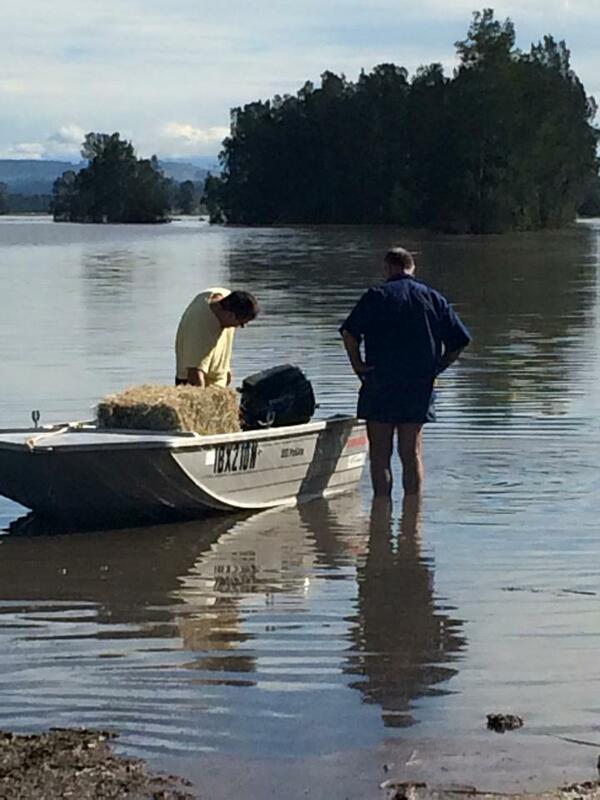 There are fires, bushrangers, natives, and of course floods. 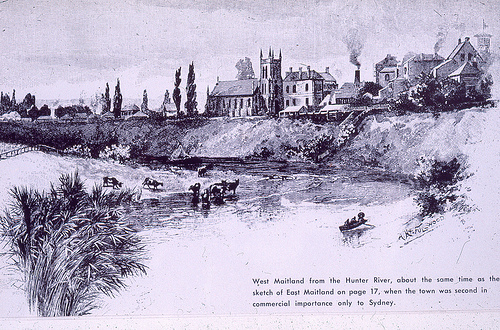 I’ve made use of 1830’s diaries and journals to get a sense of place and time, and have already written of a flood that decimated crops and livestock. Now, having been through this natural disaster, and experienced the devastation first hand I have more scope for my writing. The above is a picture of my husband (standing in the water) and my sister’s brother in law going by boat to “rescue” my brother in law and nephew from their stranded and water logged house; and taking hay to cattle on tiny islands of high ground and seeing floating dead cows, I have so much more to add to my story. A part of me feels that using this experience is a little off. Like ambulance chasing, but on the other hand, I hope this last week or so can add a depth of reality to my writing. Sometimes a writer must delve into the darker side of life. We examine the hard stuff. Sometimes we write about the things that make us cry, and sometimes if feels like we can hardly express it. I like to read the hard stuff, to delve into the real thing. When you read or write, do you like to go into the dark places? Do you like a story with the hardships laid out, or do you prefer a more romantic view of life?